‘CELTIC’ MEANS VARIOUS things to many, but Bernhard Maier’s comprehensive history The Celts ‘seeks to do justice to the term ‘Celt’ in all its aspects’, spanning both time and place; the aim to make sense of Celtic culture for general readers, while giving specialists up-to-date overviews of the current knowledge of Celtic studies through providing references to all sources. That there are no illustrations of any kind – bar maps – within limits the attraction of an undoubtedly important work to general readers, who will find these pages tougher to digest than the student already exposed to the image laden material culture of the Celts. Drawing on this wealth of archaeological and historical, as well as literary and linguistic evidence, Maier’s work is, like Gaul, divided into three parts. Presented first are the continental Celts of antiquity, with their bewitching, iconic archaeology beginning at the Iron Age West Hallstatt culture, when they first appear; their crafts, especially metalwork, and trade goods like amber already developed and specialised. The early La Tene period of the fifth and fourth centuries bc, typified by its free-flowing artistic representations of plants and animals in its decorative art found as grave goods, is followed by surveys of the Celtic expansion into northern Italy, Iberia and Asia Minor; and the Romanisation of Gaul, which effectively marked the beginning of the end of Celtic independence in mainland Europe. Secondly, the mediaeval history of the Celtic peoples of Ireland, Britain and its colony, Brittany, is covered, with particular emphasis on Celtic christianity, political, legal and social foundations, and language and literature evolution; and the transformation of these traditional mores that resulted from loss of political independence. The third part deals with the modern Celtic world since the Reformation; its enduring and seemingly quickening power to excite the imagination and enthrall. In Europe’s Inner Demons (1974) Norman Cohn showed various mediaeval popular beliefs about witches combining in fantastic, provocative delusions in the sixteenth and seventeenth centuries to cause the great witch-hunt; something of a growth industry in Scotland where between one and two thousand people, mostly women, were drowned or burned at the stake. While recent individual case studies have furthered Christina Larner’s pioneering Enemies of God (1981), itself a comparative study, this is the first since to discuss the Scottish witch-hunt as a whole. 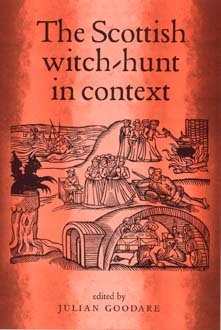 Among the contributions, that of Ronald Hutton stands out in revealing a wealth of comparative material bearing upon our understanding of ‘The global context of the Scottish witch-hunt’; this goes beyond Cohn to argue that the sixteenth-century eruption of witch-hunting was merely a resumption of the ‘business as usual’ mentality, which had generally pertained prior to a long mediaeval hiatus. Other contributors show the parts played by the ‘elite’ groups within Scots society: the sad fact that the whole sorry affair was driven from the very top, the monarchy not excepted – vide Jamie Saxt’s Daemonologie – in a chain of command reaching down to the parish minister, kirk session and local busybodies who inflicted grief upon the most vulnerable or uncompliant members of their communities. Most disturbing is the evidence given by Louise Yeoman that many false accusations were made by men against women of property – ‘the rich witch’ – as a pure means to an end. One particular ‘panic’, that of 1597, is examined by Julian Goodacre, as is, by Michael Wasser, the last major witch-hunt of 1697-1700, a time uncomfortably close to the modern era. Fife witchcraft cases 1560-1705 are demo- graphically discussed by Stuart Macdonald. Combined, these papers comprise a remarkable insight to a Scotland embroiled in social uncertainty as it propels itself towards a more enlightened milieu. The Celts by Bernhard Maier (translated from the German by Kevin Windle), Edinburgh University Press, 2004. HB £45 ISBN 0 7486 1605 5. PB £15.99 ISBN 0 7486 1606 3. The Scottish Witch-Hunt in Context, edited by Julian Goodacre, Manchester University Press, 2004. HB £47.50 ISBN 0 7190 6023 0. PB £14.99 ISBN 0 7190 6024 9.